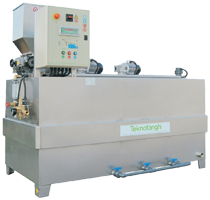 Teknofanghi’s Polypreparation and Dosing unit have been prepared for Application where the Polyelectrolyte has to be fed on a continuous basis with accurate control of dilution and ageing. This is a completely automatic unit. 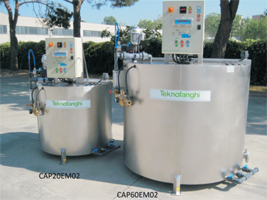 Precise control of the polydilution process. Available in various capacities such as 750, 1500, 3000 – 6000 lt/hr. Reduction in wastage of Polyelectrolyte and water. Ease and comfortable in operation.